SINGAPORE – A committee tasked to chart a comprehensive 10-year blueprint in making Singapore workplaces safer and healthier is studying ways to help companies and developers better understand the track record of contractors when deciding on project tenders. Mr John Ng, chairman of the Workplace Safety and Health (WSH) Council, said this is one of the ideas being discussed by the WSH2028 Tripartite Strategy Committee, which was announced by the Ministry of Manpower (MOM) earlier this year. “This will encourage more contractors to invest in improving their safety and health track record,” he added in a Facebook post on Tuesday (July 31). Speaking at the WSH awards ceremony on Tuesday, Manpower Minister Josephine Teo cited how some companies already require their sub-contractors to have bizSAFE Level 3 certification as a minimum – a practice that government agencies already adopt in awarding public construction project tenders. “When the customer imposes such a requirement, it reinforces the importance of safety and health in the workplace. Both sides also stand to gain from reduced downtime due to accidents or costs incurred because of safety lapses,” she added. Both Mr Ng and Mrs Teo said the idea arises from discussions between committee and stakeholders like employers, unions, professional associations, safety officers and workers from different industries on how workplaces can be safer and healthier. Mrs Teo said one recurring theme in the discussions was for the senior management to take the lead in driving WSH. She said senior management of companies or even sub-contractors and suppliers could set the tone for the rest in their organisations if they are committed to WSH. “Conversely, if the senior management shows little or no interest, it is unlikely that the rest of the company or its associates will take WSH seriously,” she added. Mr Ng, who chairs the committee, said it will be launching public consultation via the website of government feedback unit REACH in August. At this year’s awards organised by the WSH Council and MOM, the Keppel Group emerged as the top winner, winning 28 out of the 158 awards. Mrs Teo said that the efforts of these companies and individuals have ensured that over 150,000 workers go home safely each day. 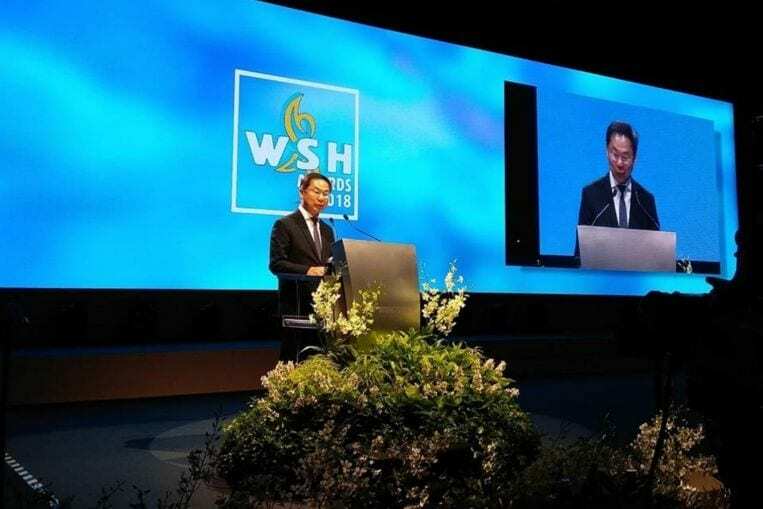 She said an example of strong ownership of WSH was Keppel Singmarine, which is part of Keppel Group, that remained accident-free throughout 2017. She added that first-time Gold award recipient Bintai Kindenko, a company that specialises in mechanical and electrical engineering, regularly shares near-miss incidents on-site, and kept both employees and sub-contractors involved. The company has been accident-free since 2014. Mr Ng said the overall workplace fatal injury rate was 1.2 per 100,000 workers last year. This was down from 1.9 in 2016. Under the WSH Innovation category, there were 11 award recipients, the highest number in the last five years. One of which is engineering and maintenance firm CYC International, which developed a tank-cleaning robot in 2016. This year, the company created an improved model – a submersible machine which cleans underwater thick sludge, chokes and waste in tanks and other areas such as large public drainage systems. “(It) eliminated the risks associated with the traditional method of man-entry into confined spaces, and reduced the impact of heat stress and fatigue for workers during difficult phases of cleaning,” Mrs Teo said. She added that it also reduced the amount of manpower needed – from 20 men to six – as well as the cost of water disposal – from about $ 10,000 to $ 500.